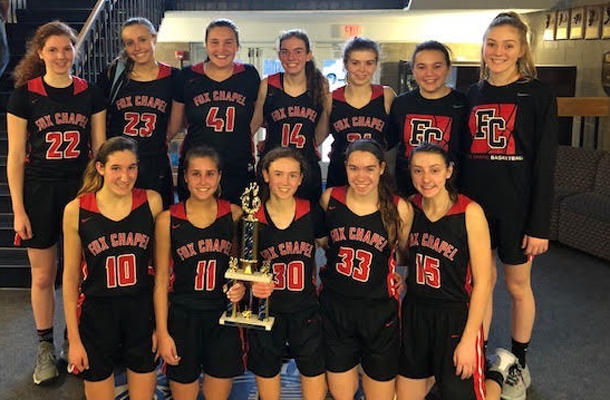 Winning the Peter Sauer Memorial Tournament held over the holidays was the perfect and well-earned present for the Foxes’ girls’ basketball team. The Foxes defeated Avonworth in their first game, 53-22, and then scored a come-from-behind win against Shady Side Academy 42-38. Shady Side previously was the top-ranked team in their conference and had a 7-0 record. For the Foxes, the top scorers in the match up against Shady Side were Gabby Guerrieri with 14 points and Claire Fenton scored 12 points. Ellie Schwartzman had 12 points against Avonworth and Gabby contributed 11 points. So far, this is the team’s best start since Coach O’Shea took over in 2014.